mightyglydd wrote: Thanks Frank, just got the whole 'set' updated via 'check for updates'.. It was the - #4. Firefox 40 Toobarbutton size fix. that was the important one there. That one would have blown stuff up bigtime if not done. Always worth staying a good few versions ahead on these things. I have both the Metal Lion Australis Graphite (v2.0.1.6.2.1) and Tiger (v2.0.1.7.2.1) themes installed, with the Graphite theme active. I do not use automatic updates. I am running Firefox v 38.0.5 on Windows 7 x64. For the past few weeks, when I check for updates, both Metal Lion themes show that updates are available yet after updating them, the updates still show as available. I have tried uninstalling/re-installing both themes, but the problem won't go away. I could update these themes 20 times a day, and they would still show updates available. Any help? Also, if please point me to the proper place if this is not where I should post this question. Thank you very much. Last edited by DanRaisch on June 11th, 2015, 10:03 am, edited 1 time in total. Reason: Moved to Theme Development so Frank Lion can comment on the issue. Hoppy wrote: I have both the Metal Lion Australis Graphite (v2.0.1.6.2.1) and Tiger (v2.0.1.7.2.1) themes installed, with the Graphite theme active. I do not use automatic updates. I am running Firefox v 38.0.5 on Windows 7 x64. You already have the latest updates of these themes (see previous page) and I doubt if I'll be doing another update of these for a few months and when I do the updates will be announced on this thread. ..that is what the .1 relates to on the end of the version numbers. However, their signing stuff did not go without incident - https://bugzilla.mozilla.org/show_bug.cgi?id=1172696 I am assured that all will be well in due course. As I'm sure you'll appreciate, I can only provide fit for purpose, fully working themes to AMO and have to leave it to them to fix what they mess up after that. However, as I said, you already have the latest versions, so at least you don't have to check for updates for a good while. @ Frank and patrickdempsey -- Thank you for your responses. It's really not that big of a deal ... just annoying. ..and, yes, commiseration does help. It's too bad some people just can't leave a good thing alone (i.e., the signing issue you refer to -- about which I have no clue and must read). I guess I'll just have to live with it until they decide to set things right. While I have your ear, Frank, thank you so much for these themes. Normally, I don't like dark themes because I lose some icons on my toolbar, but both of these are not "crazy dark". It is difficult to see a couple icons, but I can live with it since I like the themes so much. Thank you for your hard work, creativity and for sharing. Hoppy wrote: While I have your ear, Frank, thank you so much for these themes. Normally, I don't like dark themes because I lose some icons on my toolbar, but both of these are not "crazy dark". It is difficult to see a couple icons, but I can live with it since I like the themes so much. Thank you for your hard work, creativity and for sharing. Thank you for your kind comments, you are most welcome. How do I apply the snippet of code you gave to disable the subject "feechur?" You just follow this - viewtopic.php?p=14005643#p14005643 Usually, you would have to create the folder and files yourself, but to make it easier, I've done it for you. how do you edit your theme... css, omni.ja, etc. and where is it? I love the graphite theme and use the tabs on the top version. Is there anyway to lighten up the graphite darkness a bit? 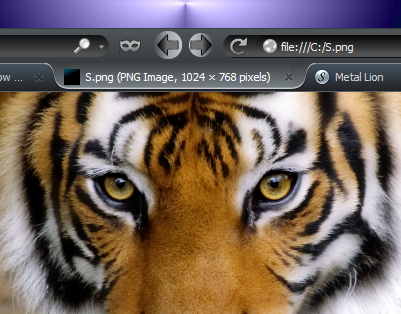 I do website HTML coding a lot and understand CSS, but where are the CSS files for the tiger theme? Styling of various features improved and 'under the hood' fixes to ensure forward compatibility with Firefox 42+. i.e. lots of stuff done. By the way, that signing bug mentioned above has now been fixed by Mozilla/AMO, so the signing of these should now all be sorted. Let me know if you find differently. Status - All passed AMO review and now available. Thanks for your talent and hard work. All the toolbar buttons on my themes, both their own and 'non-native', are coded to have the same left/right spacings. As more buttons are added to the Nav bar the addressbar shrinks to accommodate them and if you really fill it up then overflow arrows appear at the right hand side and the extra buttons are in a dropdown box. From your screenshot, it doesn't look like there is much addressbar shrinking going on there. Try seeing what you get when using the default theme. Possibly one of your extensions playing up (?) or you could try putting those buttons on the Bookmark Bar instead. Everything is working as it should be at this end and I've been unable to reproduce your problem.